The fantastic Warner brothers sent us the new Scooby-Doo, Mask of the Blue Falcon. I've been a massive scooby doo fan since I was small. So it was a perfect time to get the duvet out and have a film day and see what adventures the mystery gang will be on. This time the gang investigate at the Mega Mondo Pop Cartoon-a-Con where the villainous Mr. Hyde releases a horde of evil creatures. 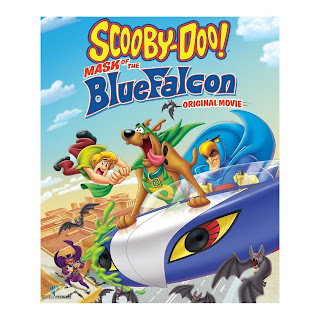 Shaggy and Scooby take inspiration from their favourite superheroes Blue Falcon and Dynomutt as they attempt to put a stop to Mr. Hyde's wicked ways and save the convention. We all really enjoyed watching the gangs adventures, even Lexie sat and watched most if it too.